Butternut Squash & Chorizo Risotto is an excellent example of another quick and easy midweek dinner. I simply love risotto and how versatile it is. It allows you to play with different ingredients to create stunning yet uncomplicated meals. That’s exactly what all of us need at the end of busy working day. You might have figured out by now that I’m partial to a bit of butternut squash (Easy Roasted Butternut Squash Veggie Wellington) and chorizo (Easy Prawn & Chorizo Cheat’s Paella) or both at the same time (Easy Butternut Squash & Chorizo Gnocchi). They are both staples in my kitchen and I always have them to hand. They are excellent additions to many different dishes as well as being stars in their own right. My secret ingredient in this risotto is smoked paprika which hand in hand with chorizo gives this traditionally Italian dish a Spanish feel. In this recipe I specified 2 heaped teaspoons of smoked paprika which I believe gives a little bit of smokiness without overpowering the risotto. However, I tend to sprinkle a tad more on my portion after plating up but that’s down to your own personal preference. For this recipe we need butternut squash in a form of a rough mash (no perfectly smooth puree required here). I usually prepare it by roasting peeled & cubed squash in 180°C/350F for about 25min until tender. Another (and perhaps less laborious) way of doing it is to roast the entire squash (skin and all) in 180°C/350F oven for 1.5 hrs. All you need to do then is cut it open and scoop out all the lovely mushy flesh discarding the seeds. Whichever way you choose, try and plan ahead to make it work for you during the busy week. If, however, planning ahead is not an option, you can still prepare this lovely meal in next to no time by multitasking! That’s right! You can start on your risotto whilst butternut squash is roasting (peeled and cubed version not the entire squash) to save yourself good 20 minutes and making this risotto a true midweek meal option! This risotto is a meal in itself but I tend to serve it with some seasonal veg on the side. Steamed Cavolo Nero (Black Kale) is particularly delicious here. If you are a fan of risottos make sure you check out my Leeks & Smoked Mackerel Risotto or Asparagus & Sun-Dried Tomato Risotto – both really quick, easy and full of flavour! I love using homemade chicken stock in my risottos! Feel free to check out my guide on How To Make Chicken Stock in Instant Pot (with instructions for hob/stovetop users too). You will never look back! This Butternut Squash & Chorizo Risotto combines Spanish & Italian cuisine in one delightful dish. Quick and easy meal with heaps of flavour! Start by preparing butternut squash. Preheat the oven to 180C/ 350F/ Gas Mark 4. Peel your butternut squash, deseed it and cut into chunks. Pop it on a baking tray lined with aluminium foil with a glug of oil (make sure all the pieces are evenly coated) and roast for approx 20-25 min until tender. Once roasted, you should be able to mash it into the rough puree with the fork. Set aside. In the meantime melt butter in the pan, add the onion and cook for 5 minutes until softened but not coloured. Add garlic and continue to cook for another 2 minutes, stirring and not letting garlic to burn as it will turn bitter. While onion is cooking, skin and slice the chorizo. Fry it gently in a dry frying pan until it releases all the beautiful oils. Set aside. Add rice to the onion mix and stir well for 1 minute. Slowly start adding your hot stock ladle at a time. Altogether it should take you approx 15-17 min to achieve perfect consistency of risotto. It should be nice and plump and still have tiny bit of "bite" to it (be slightly al dente). You should use up all your stock. Add your mashed up butternut squash, smoked paprika and chorizo with all the released oils and stir well, making sure they coat the rice nicely. Adjust seasoning as per your preferences. Add grated parmesan and some more butter (optional )and mix these in gently. Let your risotto stand for 5 minutes before serving. Garnish with chopped parsley and enjoy with some extra parmesan and a side of seasonal veg. Nutritional information is approximate and meant as a guideline only. Feel free to sprinkle some extra smoked paprika on your portion after plating up. To save yourself some time, consider roasting butternut squash ahead of time or (if roasting it peeled & cubed) start on your risotto at the same time as squash goes into the preheated oven. You will save yourself good 20 min from the total time it take to make this dish making it truly quick. (Total preparation time of this recipe is based on butternut squash being roasted ahead of time or simultaneously with risotto). Pin Butternut Squash & Chorizo Risotto for later! Love the colour of the risotto, makes it look so tempting. I’ve yet to try making risotto at home but have enjoyed it at restaurants. Adding butternut squash to it is a great way to add a variety of veggies to one’s diet. I enjoy making different flavored risottos – your version with the squash is perfect for Fall. Adding chorizo put this recipe over the top! Jo what a gorgeous looking risotto! 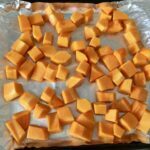 😀 I love butternut squash but would never think of using it like this – I wonder if I could get the boys to eat it too! Thanks for linking up and sharing at Fiesta Friday this week. Have a great weekend. Thank you Laurena! 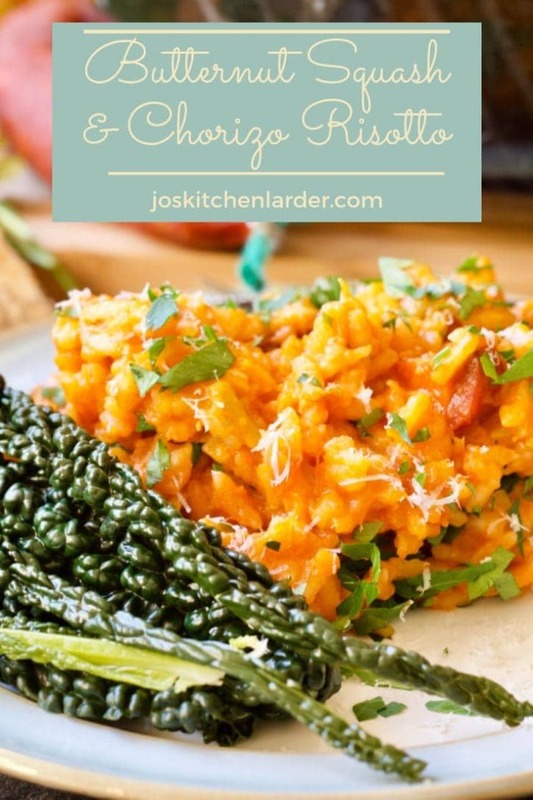 My kids absolutely love this risotto and my youngest is not really crazy about butternut squash although he will eat it. Here in combination with smoked paprika it works so well! What’s not to like about this recipe! Looks fantastic! I am also a massive fan of butternut squash. I think the flavours in here are brilliant and it might even be a good way to hide the butternut squash for kids who are not so keen on it. I love anything with chorizo in so this would definitely be perfect for me! This is my kind of risotto! I really love the look of this, chorizo is my weakness…I don’t eat enough squash in general so I have pinned this to try soon! Thank you for sharing with #CookBlogShare. this is very much my kind of recipe. I love chorizo, risotto and all kinds of squash. It looks lovely and sounds like it’s packed with flavour! Is it worth standing there, adding the liquid a little at a time? I can be a bit lazy when cooking and thankfully Gallo Arborio rice has always been incredibly forgiving.